Trade unions, or labour unions, have been standing up for the rights of workers since the 1800s. Chances are you know people who are in a union, or maybe you have heard many different opinions on what unions are, what they do and whether they’re good for workers, companies and society. In Canada alone, unions represent over four million workers, creating safer, healthier, fairer workplaces in almost any industry you can imagine. Maybe it’s time you consider joining or forming a union. Union membership means better pay, security and a promise of fair treatment on the job. But what about strikes? Where do union dues really go? If you have questions, we have answers. 1. Who Runs a Union? A union is a group of employees who recognize there is power in numbers and decide they want to negotiate their work conditions as a collective, rather than trying to achieve fairness on their own. The members are the union, and everyone is equal within it. The day-to-day operations are carried out by members who are committed to promoting and nourishing the union. Teamsters Union 987 has an executive board which is chosen by a vote of the membership. Within each bargaining unit, there are Shop Stewards who are the first point of contact for members who have questions in their own workplaces. These are volunteer roles. Teamsters Union 987 also employs paid staff who are experts in organizing new bargaining units and negotiating contracts and agreements with employers. There is also a small team of office staff. 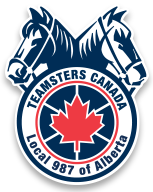 To learn more about the structure of Teamsters Union 987, see our 987 Team page. 2. What are union dues and where do they go? Think of union dues as insurance for your job. You pay for insurance for your vehicle and your home, so why wouldn’t you insure the one thing that allows you to afford those things: your job? Teamsters Union 987 union dues represent approximately 1.5 percent of members’ annual wages, or 2.5 hours of monthly pay. The price of a daily coffee is a minor amount to pay for job security and the peace of mind that as a member, you are protected from all kinds of unfair treatment in the workplace. Dues are collected from all members equally in accordance with their wages, and the benefits that come from the revenue collected are distributed equitably amongst the membership. Tangibly, they pay for professional negotiations, to train Shop Stewards, to strengthen and grow the membership, and for expert advice and legal representation when needed. A small portion of dues go towards supporting our national and global organizations, Teamsters Canada and the International Brotherhood of Teamsters. Membership in these large and powerful organizations affords Local members the benefits of political advocacy, access to student scholarships, a place in the united organization of unionized workers around the world who stand up for their rights in the workplace. 3. If we unionize, will we have to go on strike? While this is something the media often reports about unions, strikes don’t actually happen very often here in Canada. In fact, in Alberta, over 98 percent of contract negotiations are reached without a strike. Strikes only happen when the union and its members agree by a vote that they are prepared to stop work until the employer agrees to the proposed terms of the collective bargaining. A lockout, on the other hand, can occur when the employer tries to force the union to agree to its terms by “locking out” workers and refusing to allow them to work until an agreement is reached. These are also very uncommon, as Teamsters Union 987 and other unions are professional negotiators with plenty of experience working out the best deals possible on behalf of members. 4. What happens if an employee tries to take advantage of the union’s protection? Unions fight for fairness in the workplace, and Teamsters believe strongly in an honest day’s pay for an honest days work. This means that if a unionized employee is regularly slacking off, showing up late or behaving in other ways that are unfair to their direct co-workers and employers, management is responsible for correcting their behaviour. On the same token, Teamsters Union 987 makes sure that if a worker is disciplined by their employer, that it is for legitimate reasons and not because of a personality conflict or a personal preference. This keeps the workplace fair for everyone. 5. How does seniority work in a union? Every collective bargaining agreement is different, but in most cases, seniority means that the longer an employee stays with a company, the better off they will be. Job security, wages and often vacation and shift preferences all improve over time for workers. This works as a benefit to the employer as well, as it helps to lower turnover and the challenges that come with it.